Near-infrared images of the active galaxy NGC 1097, obtained with the NACO adaptive optics instrument on ESO's Very Large Telescope, disclose with unprecedented detail a complex central network of filamentary structure spiralling down to the centre of the galaxy. These observations provide astronomers with new insights on how super-massive black holes lurking inside galaxies get fed. "This is possibly the first time that a detailed view of the channelling process of matter, from the main part of the galaxy down to the very end in the nucleus is released," says Almudena Prieto (Max-Planck Institute, Heidelberg, Germany), lead author of the paper describing these results. Located at a distance of about 45 million light-years in the southern constellation Fornax (the Furnace), NGC 1097 is a relatively bright, barred spiral galaxy seen face-on. At magnitude 9.5, and thus just 25 times fainter than the faintest object that can be seen with the unaided eye, it appears in small telescopes as a bright, circular disc. NGC 1097 is a very moderate example of an Active Galactic Nucleus (AGN), whose emission is thought to arise from matter (gas and stars) falling into oblivion in a central black hole. However, NGC 1097 possesses a comparatively faint nucleus only, and the black hole in its centre must be on a very strict "diet": only a small amount of gas and stars is apparently being swallowed by the black hole at any given moment. Astronomers have been trying to understand for a long time how the matter is "gulped" down towards the black hole. Watching directly the feeding process requires very high spatial resolution at the centre of galaxies. This can be achieved by means of interferometry as was done with the VLTI MIDI instrument on the central parts of another AGN, NGC 1068, or with adaptive optics . 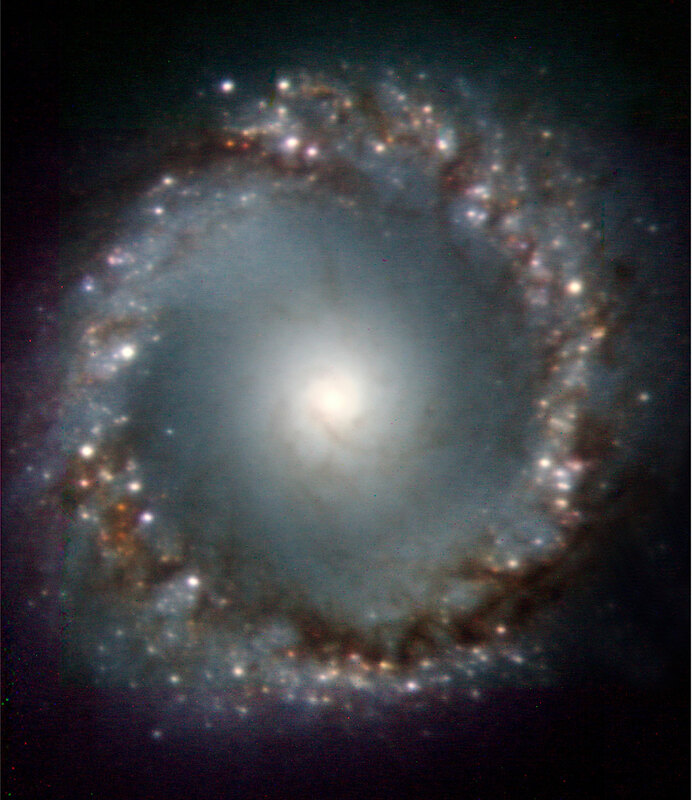 Thus, astronomers  obtained images of NGC 1097 with the adaptive optics NACO instrument attached to Yepun, the fourth Unit Telescope of ESO's VLT. These new images probe with unprecedented detail the presence and extent of material in the very proximity of the nucleus. The resolution achieved with the images is about 0.15 arcsecond, corresponding to about 30 light-years across. For comparison, this is only 8 times the distance between the Sun and its nearest star, Proxima Centauri. 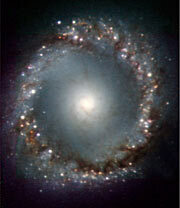 As can be seen in last year's image, NGC 1097 has a very strong bar and a prominent star-forming ring inside it. Interior to the ring, a secondary bar crosses the nucleus almost perpendicular to the primary bar. The newly released NACO near-infrared images show in addition more than 300 star-forming regions, a factor four larger than previously known from Hubble Space Telescope images. These "HII regions" can be seen as white spots in the photo. At the centre of the ring, a moderate active nucleus is located. Details from the nucleus and its immediate surroundings are however outshone by the overwhelming stellar light of the galaxy seen as the bright diffuse emission all over the image. The astronomers therefore applied a masking technique that allowed them to suppress the stellar light. This unveils a bright nucleus at the centre, but mostly a complex central network of filamentary structures spiralling down to the centre. "Our analysis of the VLT/NACO images of NGC 1097 shows that these filaments end up at the very centre of the galaxy", says co-author Juha Reunanen from ESO. "This network closely resembles those seen in computer models", adds co-worker Witold Maciejewski from the University of Oxford, UK. "The nuclear filaments revealed in the NACO images are the tracers of cold dust and gas being channelled towards the centre to eventually ignite the AGN." The astronomers also note that the curling of the spiral pattern in the innermost 300 light-years seem indeed to confirm the presence of a super-massive black hole in the centre of NGC 1097. Such a black hole in the centre of a galaxy causes the nuclear spiral to wind up as it approaches the centre, while in its absence the spiral would be unwinding as it moves closer to the centre. An image of NGC 1097 and its small companion, NGC 1097A, was taken in December 2004, in the presence of Chilean President Lagos with the VIMOS instrument on ESO's Very Large Telescope (VLT). "Adaptive Optics" is a modern technique by which ground-based telescopes can overcome the undesirable blurring effect of atmospheric turbulence. With adaptive optics, the images of stars and galaxies captured by these instruments are at the theoretical limit, i.e., almost as sharp as if the telescopes were in space. The astronomers are M. Almudena Prieto (Max-Planck Institute for Astronomy, Heidelberg, Germany), Witold Maciejewski (University of Oxford, UK), and Juha Reunanen (ESO, Garching, Germany). This ESO Press Photo is based on research published in the October issue of Astronomical Journal, vol. 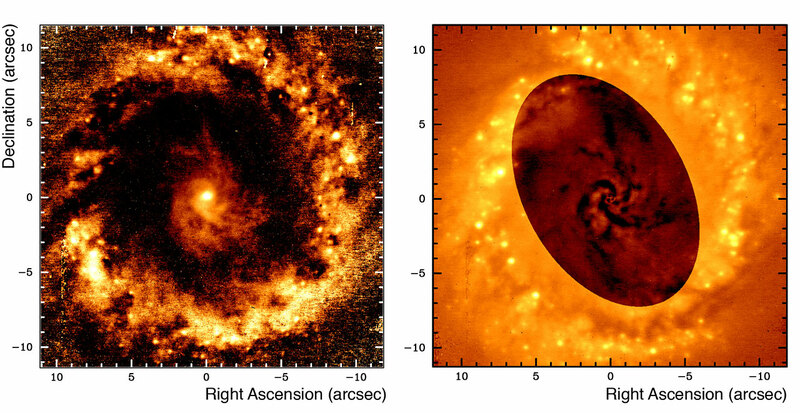 130, p. 1472 ("Feeding the Monster: The Nucleus of NGC 1097 at Subarcsecond Scales in the Infrared with the Very Large Telescope", by M. Almudena Prieto, Witold Maciejewski, and Juha Reunanen).